Robotic vacuum cleaner is commonly called as robovacs and it is mainly used for cleaning residential and small commercial spaces, such as pools, gutters, and floors. The unit of the robotic vacuum cleaner comprises a mobile base, batteries, cleaning system, programming software, and other accessories. Robotic vacuum cleaners use intelligent sensors and a camera mounted on top to clean tight corners and hard-to-reach surfaces. Robotic vacuum cleaners are equipped with advanced features such as laser vision, room mapping, and robotic self-charging to offer convenience to users. Other features include spinning brushes, mopping, security cameras, UV sterilization, navigation technology, and intercom systems. All these features are expected to drive the overall residential robotic vacuum cleaner market during the forecast period. Changing lifestyles and busy work-schedules have led to the use of residential robotic vacuum cleaners. The lifestyle of people have changed over the past decade and people spend long hours in their office. This leads to lack of time to do household chorus and creates demand for robotic vacuum cleaners. Rising technological advancements are expected to accelerate the residential robotic vacuum cleaner market across the world. Manufacturers are developing the product by introducing various changes in the product. For instance, Dyson Company launched Dyson 360 which has a 360° camera on the top and helps in navigation. In 2017, Xiaomi Corporation launched a robotic vacuum cleaner with 12 different sensors for scanning the area and creates algorithm and a virtual map for efficient navigation. Increasing industrialization has led to rise in health hazards due to air pollution. 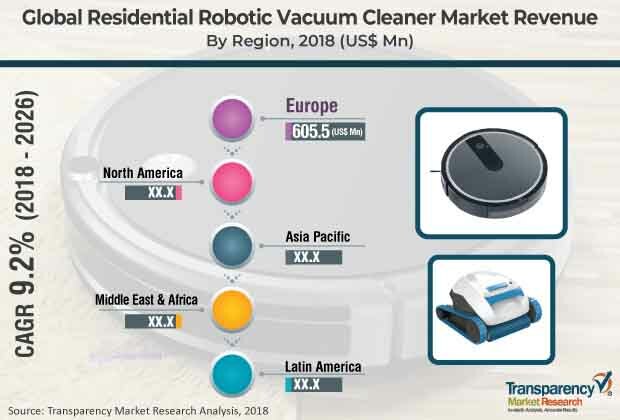 Growth in awareness about health and benefits of vacuum cleaners are important factors which are creating huge opportunity for the residential robotic vacuum cleaner market across the world. The global residential robotic vacuum cleaner has been segmented on the basis of product, charging type, operation mode, distribution channel, and geography. Based on product, the market has been segmented into in-house robot and outdoor robot. As compared to outdoor robot, in-house robot is expected to hold major share in the overall residential robotic vacuum cleaner market. On the basis of charging type, the market has been classified into manual charging and battery charging. In manual charging, the robotic vacuum cleaner gets charged through human interaction and in battery charging, the robotic vacuum cleaner gets to the station for the charge whenever the sensor detects the battery low information. This increases the market attractiveness of the battery charging segment. Based on operation mode, the market is segmented into self-drive and remote control robot. Self-drive robot does not require any human interference and operates automatically, while the remote control robotic vacuum cleaner needs humans to operate and monitor the operation of the robotic vacuum cleaner. Although it is the largest contributor to the global residential robotic vacuum cleaner market, the remote control segment is expected to witness slower growth rate as compared to the self-drive segment over the forecast period. Asia Pacific is likely to be the most attractive region during the forecast period due to the steady adoption of household electrical appliances. Manufacturers are keen on entering the Asia Pacific region in order to grab significant market share during the forecast period. However, North America and Europe dominated the overall residential robotic vacuum cleaner market due to the preference toward premium brands among the population. As compared to other regions, Middle East & Africa and South America are expected to have a slower growth rate during the forecast period. The residential robotic vacuum cleaner market is fragmented due to the presence of several players. Competition is expected to intensify in the coming years, due to the entry of several local players. Key companies profiled in the research report include iRobot Corporation, Neato Robotics, Inc., Dyson Inc, Ecovacs Robotics, Inc, Philips Electronics N.V, Samsung Electronics Co., Ltd, BLACK+DECKER Inc. (Stanley Black & Decker, Inc.), Robert Bosch GmbH, Panasonic Corporation, Miele & Cie. KG, LG Electronics Inc, Haier Group Corporation, Electrolux AB, Bissell Inc, Cecotec Innovaciones Sl, and others. This report on the global residential robotic vacuum cleaner market provides analysis for the period 2016–2026, wherein 2017 is the base year and 2018 to 2026 is the forecast period. Data for 2016 has been included as historical information. The report covers market dynamics, including drivers, restraints, opportunities, and trends expected to influence the growth of the residential robotic vacuum cleaner market during the said period. The study provides comprehensive analysis on market growth throughout the above mentioned forecast period in terms of value and volume estimates (US$ Mn and Thousand Units) across different geographies. The global residential robotic vacuum cleaner market is projected to expand due to dynamic aspects such as increase in expenditure on household appliances and increasing awareness about indoor health and hygiene. However, the global residential robotic vacuum cleaner market is facing a challenge from substitutes in the market. Nevertheless, investment in research and development to make innovative products is likely to offer attractive opportunities to the market. Efficiency, running time, and room coverage is trending in the global residential robotic vacuum cleaner market. The residential robotic vacuum cleaner market has been segmented based on product, charging type, operation mode, distribution channel, and region. Based on product, the market has been classified into in-house robot and outdoor robot. In terms of charging mode, the market has been categorized into manual charging and battery charging. Based on operation mode, the market has been categorized into self-drive and remote control. In terms of distribution channel, the global residential robotic vacuum cleaner market has been categorized into online and offline. Based on region, the report classifies the market into North America, Europe, Asia Pacific (APAC), Middle East & Africa (MEA), and South America. The report highlights key developments in the residential robotic vacuum cleaner market. Porter’s Five Force Analysis, which identifies bargaining power of suppliers, bargaining power of buyers, threat from new entrants, threat from substitutes, and degree of competition is included in the report. Value chain analysis, which shows workflow in the residential robotic vacuum cleaner market and identifies raw material service providers and distribution channels are covered in the report. Segment trends and regional trends are part of the report. It also covers segment-wise comparison matrix, technology development analysis, policy and regulation, incremental opportunity analysis, and market positioning of key players for all regions covered in the scope of the study. The report includes a competition landscape, which covers competition matrix and market share analysis of major players in the global residential robotic vacuum cleaner market based on their 2017 revenues. It also includes profiles of major players. Competition matrix benchmarks leading players based on their capabilities and potential to grow. Factors such as market position, offerings, and R&D focus are attributed to a company’s capabilities. Topline growth, market share, segment growth, infrastructure facilities, and future outlook are attributed to a company’s potential to grow. This section also identifies and includes various recent developments by leading players in the residential robotic vacuum cleaner market. Company profiling includes company overview, major business strategies adopted, and key developments. The companies profiled in the global residential robotic vacuum cleaner market include Bissel Inc., Dyson Ltd., Electrolux AB, Haier Group Corporation, iRobot Corporation, Koninklijke Philips N.V., LG Electronics Inc., Miele & Cie. KG., Panasonic Corporation, Robert Bosch GmbH, Samsung Electronics, Black Decker Inc., Shark Ninja Operating LLC,Ecovacs Robotics Ltd., Cecotec Innovaciones Sl, and Neato Robotics, Inc.